After completing some upgrades of networking kit earlier today, I went for a walk around Westminster. I wanted to see what effect the terrorist attack eleven days ago had had on the area. 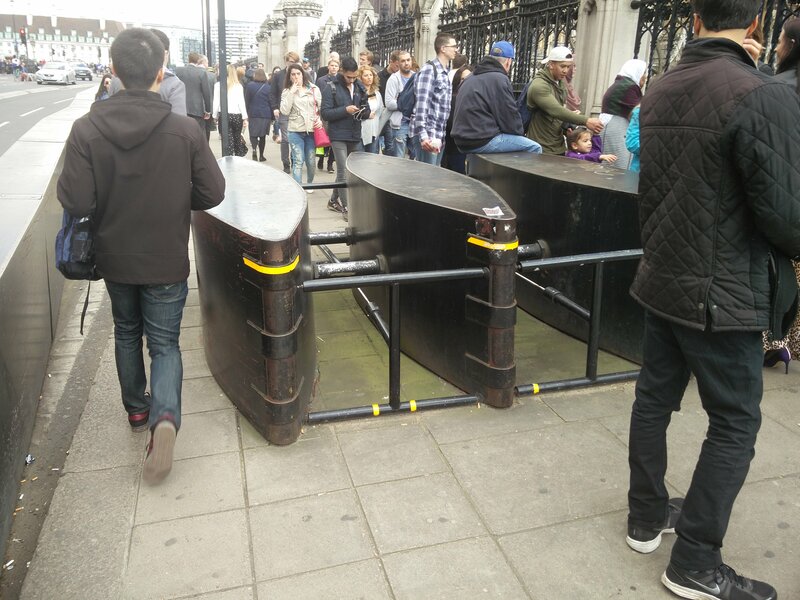 I saw additional bollard-type barriers on the pavement on Westminster Bridge which I don’t recall seeing previously. 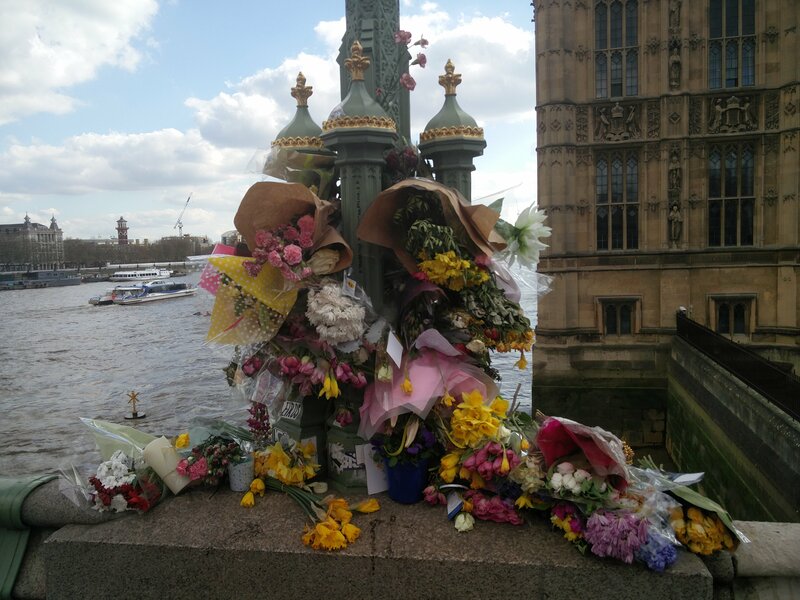 Presumably these were added almost immediately after the attack on the pedestrians on the Bridge that tragic day. However, as can be seen from the pics above, the Bridge was thankfully just as busy as ever with tourists and visitors. 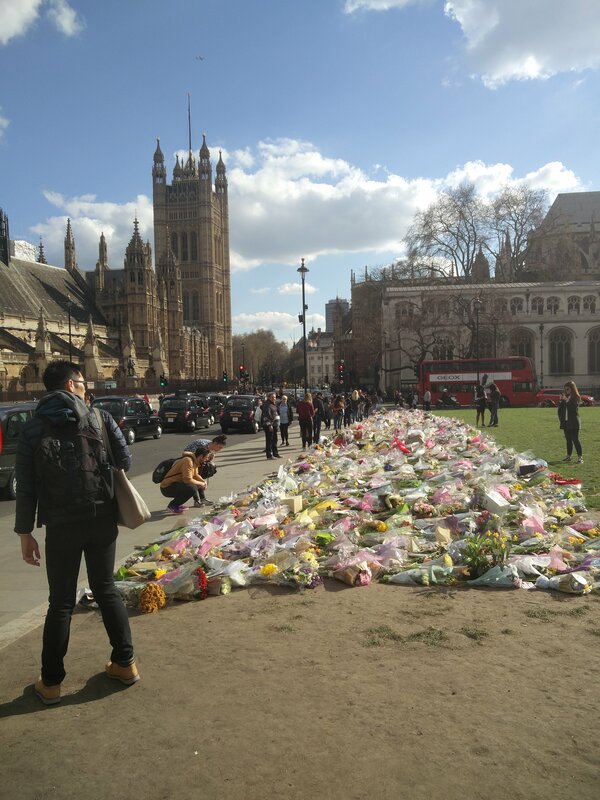 If it wasn’t for the flowers and bouquets you would never know that this was the scene of a horrific attack less than two weeks ago. It was lovely to see that normality had returned. There were many hijabis in the area – just as you would expect in an incredibly diverse city and tourist-magnet such as London. I did get into a discussion with a Moroccan guy who gave his name as “Anis” who said that the UK’s democracy was fake. He said he knew someone close to him who was in Belmarsh prison without charge for a number of years now and had developed serious mental health issues as a result. Over a decade ago, the Blair government did introduce what was in effect indefinite detention without trial for those non-British nationals who were suspected of involvement in terrorism. It was an incredibly draconian and illiberal piece of legislation which has now been replaced by TPIMs. I told him that the UK had many failings – and the fact that Blair and his shameless cheerleaders in the UK press had not paid a price for the travesty that was the Iraq invasion was clearly high on that list – it was still a wonderful place to live. It is true that recent months have seen a rise in tensions as far right elements seek to exploit the nasty anti-immigrant and racist sentiment that accompanied the Brexit vote, but this remains a strongly functioning liberal democracy and that should be a cause for hope, not despondency. This entry was posted in Extremism, Government, Walks and tagged khalid masood, tpim, westminster. Bookmark the permalink.